Edge Dictionaries allow you to create logic that doesn't need to be attached to a configuration service version. Edge Dictionaries are made up of dictionary containers and dictionary items. You can use dictionary items to create and store key-value pairs. Attaching dictionary containers to a service version allows you to turn frequently repeated statements into single function statements that act as a constant. Depending on how you created your dictionaries, you can view them either under VCL Snippets or the Data link. 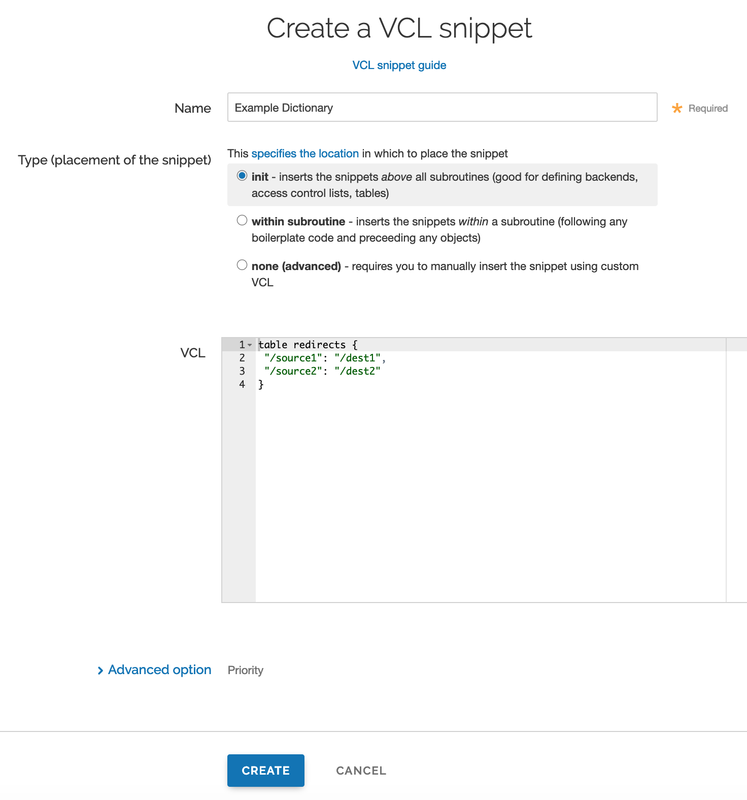 Click the VCL Snippets link. The snippet titles associated with the currently selected service version appear. To view the contents of the dictionary, click the View source button. Click the Dictionaries link under Data. Existing dictionaries, if any, associated with the currently selected service version appear. NOTE: Remember that dictionary containers are versioned. If you don't see an dictionary attached to your service, check the service version to make sure you're looking at the right one. You can create a dictionary by either using VCL Snippets or via the web interface. In the Name field, type an appropriate name (e.g., Example Dictionary). From the Type (placement of the snippet), select init. where the table is a set of key-value pairs that you can reference in your code. You can replace the contents of this table with different key-value pairs. Creating a dictionary via the web interface requires you to create a dictionary container and then create the items that will exist in it. Click the Dictionaries link under Data. The Dictionaries page appears. Click Create a dictionary. The dictionary container name field appears. In the Name of dictionary field, type a descriptive name for the dictionary (e.g., Example Dictionary). Click the Add button. The empty dictionary container you created appears. Click the Activate button to deploy your configuration changes to the service version you're editing. Click the Add item link. The dictionary item fields appear. In the Key field, type the unique identifier for some item of data (e.g., example.com). Click the Add button. The key-value pair appears in the dictionary container. This addition will become effective immediately. Once you've created a dictionary, you can start using it. In the Name field, type an appropriate name (e.g., URL redirect). From the Type (placement of the snippet) controls, select within subroutine. where table.lookup checks the dictionary for the desired contents you want. The first parameter is the table being looked in and the second parameter is the key you're looking for. If the key exactly matches the second parameter, that value is returned. Be aware that regex doesn't work with a dictionary lookup. In the Name field, type the name of your header rule (for example, Redirect lookup). 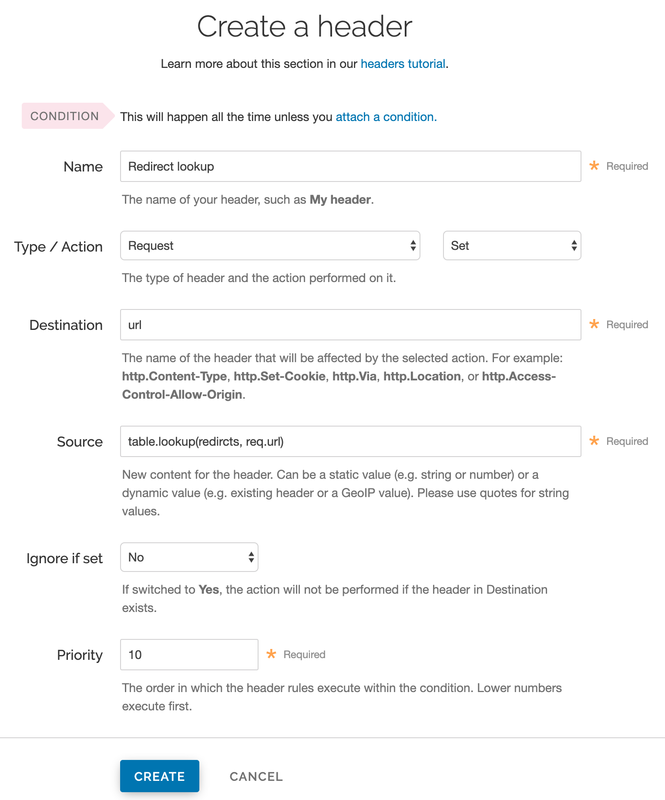 In the Destination field, type the name of the header affected by the selected action (e.g., url). In the Source field, type where the content for the header comes from (e.g., table.lookup(redirects, req.url)). Leave the Priority field as is. Click the Create button to create the header. A new header appears on the Content page. Click the Attach a condition link next to new header you just created. The Add a condition message appears. Click the Create a new request condition button. 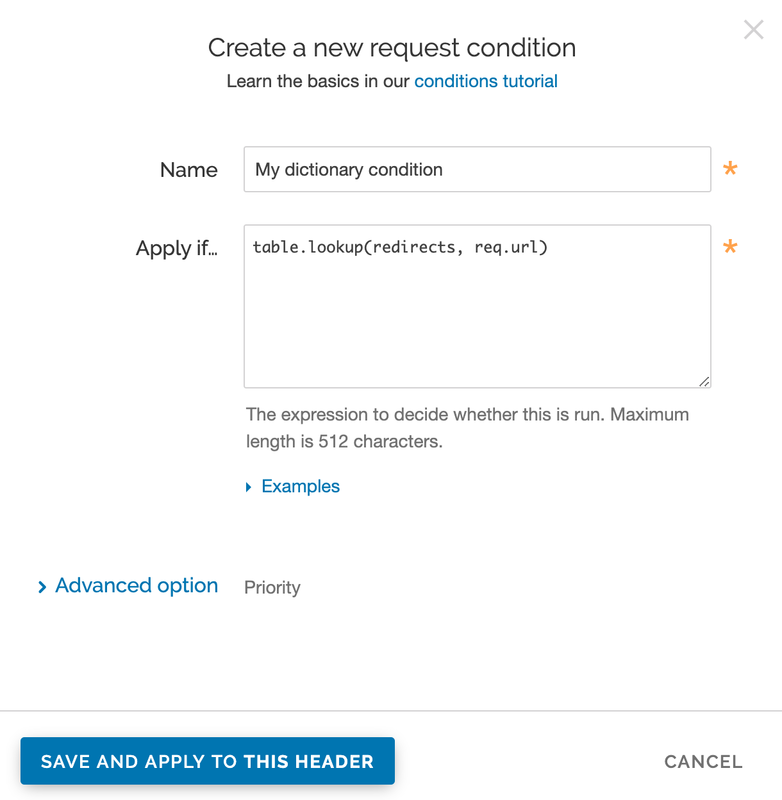 The Create a new condition page appears. In the Type field, select Request. 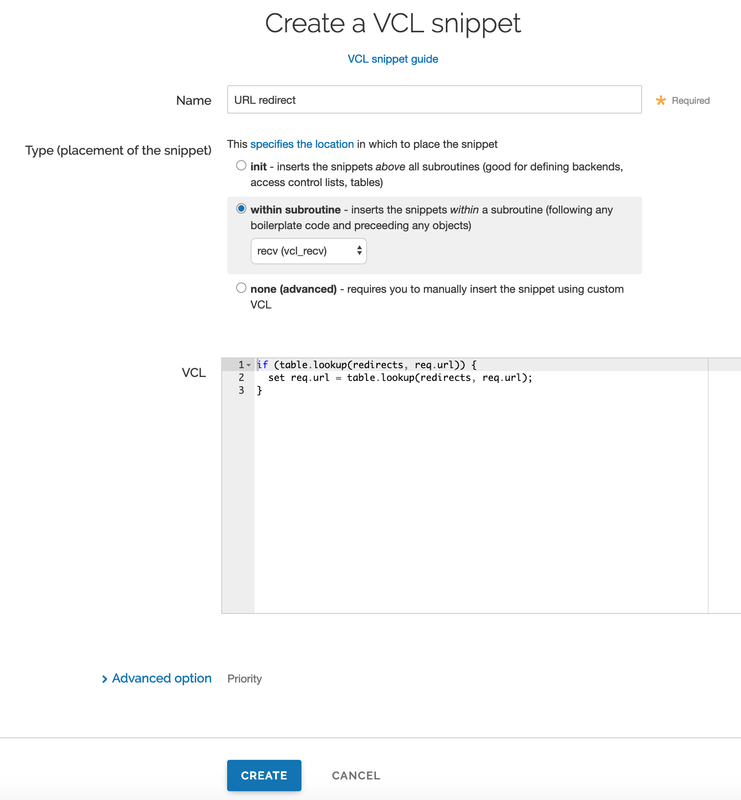 Keeping in mind their limitations, dictionaries can be edited using VCL Snippets or via dictionary containers and the items within them can be edited via the web interface. Find a dictionary associated with an unlocked version of your service. Click the pencil icon next to the dictionary.You can now make changes to the name and the condition. Click the Update button once you’re finished with your changes. Click the Activate button to activate the version you made the edits in and view the changes in your VCL. Click the pencil icon next to the dictionary container name. Change the name, then click the Save button. Find any dictionary associated with your service in which the key-value pairs appear. Because dictionary items are versionless, the service version you choose doesn't matter. Choose the one that makes the most sense to you. Hover your cursor over a dictionary item, then click the pencil icon that appears. Edit the key or value as necessary. Click the Save button. The changes you make will be immediately applied to your configuration. If your dictionary container has already been associated with a deployed service version, those changes will happen live. Keeping in mind their limitations, dictionaries can be deleted using VCL Snippets or dictionary containers and the items within them can be deleted via the web interface. Click the Confirm and delete button. Click the trash can icon in the top right corner of the dictionary. Hover your cursor over a dictionary item, then click the trash can icon that appears.